Product prices and availability are accurate as of 2019-04-25 06:38:33 CDT and are subject to change. Any price and availability information displayed on http://www.amazon.ca/ at the time of purchase will apply to the purchase of this product. High-speed USB 3.0 data transfer rates? Multiple charging ports? More data ports than you know what to do with? This hub has it all, and more. Featuring an extremely compact size and lightweight, it docks your various devices without occupying extra space. What's more, the upward-positioned ports let you plug in devices one-handed. Solves the trivials you come up with everyday, and let you stay focus on what's important in life. Don't deny your devices access to SuperSpeed ports. With transfer rates of up to 5Gbps, set aside less time for syncing and more time for work. With 7 data terminals to choose from, forget about ever having to switch or unplug again. Extra 7th-port functionality: quick-charge your USB-enabled devices whenever your computer is shut down, in sleep mode or when the hub is disconnected from a computer (otherwise, it's a standard USB 3.0 data port). With an output current of up to 1.5A, it charges three times faster than a standard computer USB 2.0 port. Dual functions, duly facilitated. A mainstay for the future. Featuring a high-grade chipset and durable adapter, this hub ensures a stable power supply while you work. Get steady operation for years to come. Whether at home or in the office, add another do-without fixture to the company of your desk. Mac OS X Lion 10.7.4 users should upgrade to Mountain Lion 10.8.2 or later to avoid unstable connections. Some USB 3.0 devices (such as Apple SuperDrive and some WD hard drives) require direct connection to host ports. 2.4Ghz wireless devices (keyboards, mice, etc.) may not work around USB 3.0 ports. Try using a USB 2.0 connection. Compact palm-sized grip (4.3 × 1.7 × 0.9in) and lightweight (2.9oz). 7 SuperSpeed ports delivering transfer speed of up to 5Gbps (Note: actual rate will depend on the capability of your device). Backward compatible with USB 2.0 / 1.1. 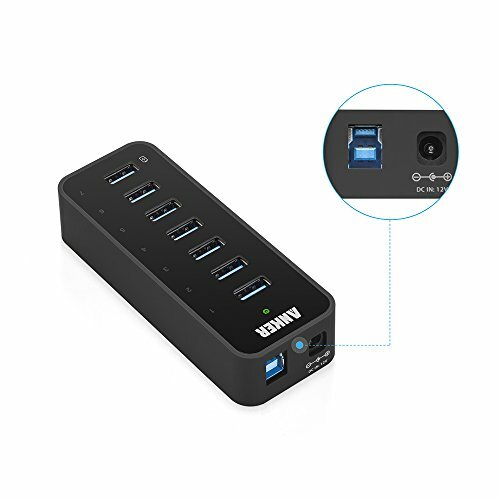 The 7th port features BC 1.2 charging, offering quick charges of up to 1.5A (refer to product description for details) to your USB-enabled devices. High-grade chipset and 36W adapter guarantee steady operation. Supports plug-and-play and hot-swapping. No installation of drivers required for Windows XP / Vista / 7 / 8 or Mac OS X 10.2 and above. 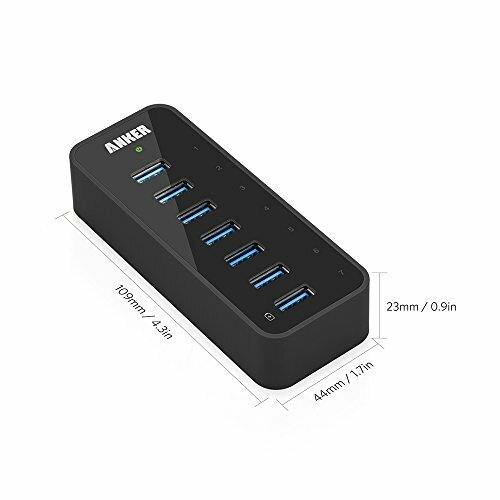 Package contents: Anker USB 3.0 7-Port Hub, 12V 3A power adapter, 2.7-foot USB 3.0 cable, instruction manual.